System comes very close to covering capital costs at standard public sector 6% discount factor even at the low £1 fare assumed (and in practice is likely to do so completely as travel patterns adapt to make more use of PRT). Surveys of passengers riding the prototype show they are willing to pay several times this fare, and are very enthusiastic about all aspects of the system. Commuters transferring from car to public transport plus PRT increase bus and rail use by 5%. Conventional public transport cannot meet this performance. 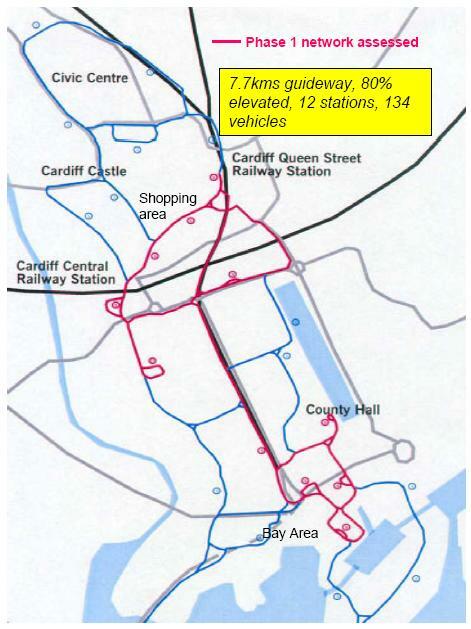 The proposed Cardiff ULTra network; the Phase 1 network (red) is assessed in detail, blue shows envisaged future expansion. ULTra PRT would provide high quality access to the Bay Area, with fast, nonstop, no-waiting and private access direct to the major attractions. Transit time from Central Station to the Bay Area is about 5 minutes and a £1 fare per vehicle was assumed (about 70p per passenger at average occupancies). The recent waterfront developments contain new offices, shops and leisure facilities, and a substantial amount of new residential development between the waterfront and the central area. The Bay area also contains the Welsh National Assembly building, the new opera house under construction, and the Cardiff County Council offices. 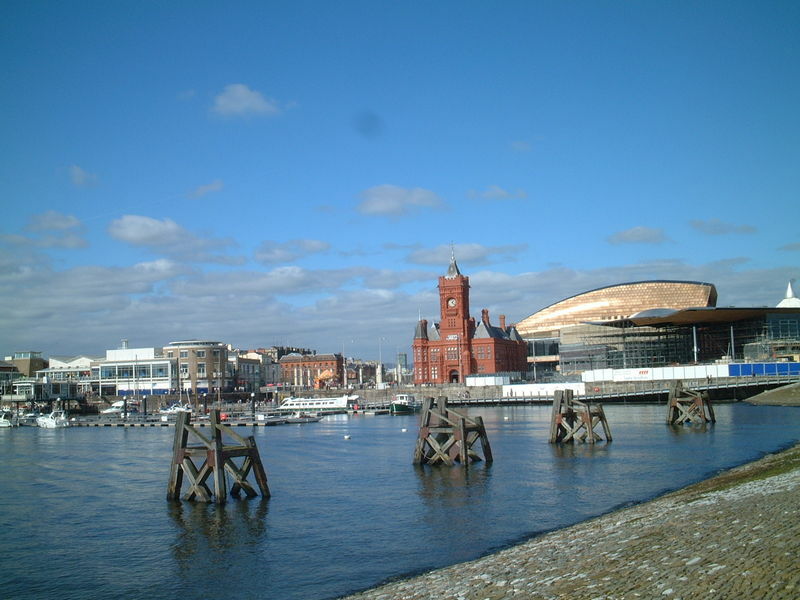 A view of Cardiff Bay.